After weeks of seeing the popular Jamaican food truck Jerk Pan parked on 48th Street and Park Avenue, I decided to see if the large crowds had it right, and Jerk Pan really is as good as it seems. The truck has an expansive menu with entrees, sides and drinks all in different sizes. By the time I arrived their signature jerk chicken was already sold out, so I tried a curry lamb platter with rice and beans and fresh salad. The only thing about Jerk Pan that got me a little nervous was watching the vendors prepare my food. Most food trucks have their meat semi-prepared, then cook it fully, assemble it and serve. Jerk Pan had their meat and gravy in grey containers which they scooped up, wiped along the side of the container to remove excess gravy and then slopped over the rice in a ready to go box. I’ve seen Chinese restaurants doing this a thousand times, just something about watching it happen in a food truck made me think twice about my order, but I pushed on, paid my $9 and got my curry lamb to go. 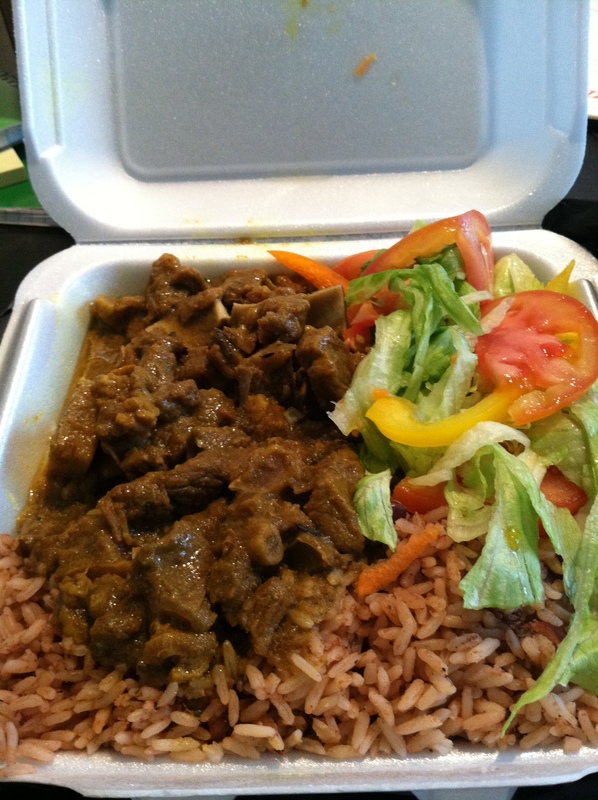 Authentic Jamaican meat comes right off the bone, and Jerk Pan’s lamb is no different. There were pieces of bone as plentiful as the meat, so this is definitely a meal you need to get a little messy with to eat. As for the taste, it was exceptional; I love spicy food, and Jerk Pan’s gravy packed a good amount of heat but definitely was not overwhelming enough to undermine the flavor of the sauce. The lamb was very tender, and the rice and beans were well cooked, and complemented the meat and gravy perfectly. Overall I found Jerk Pan to be as authentic as it gets. To quote Midtown Lunch, the ‘anemic salad’ they served as a side was just some lettuce and tomatoes, and I didn’t bother eating much of that, but the remainder of the meal was delicious, and extremely filling. Though $9 is a little more than I would like to pay from a food truck, the food was well worth it, and I learned that when it comes to food appearances can definitely be deceiving.